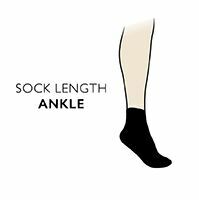 Having great kit - including fit-for-purpose hiking socks - is key to fully benefitting from and enjoying lengthy walks and hikes. With our Storm Bloc with BlueGuard Ankle High Hiking Socks, you get strength, softness and protection from highly durable anti-abrasion yarn, blended in the ultimate combination with materials designed to keep your feet comfortable and supported. Storm Bloc with BlueGuard Ankle High Hiking Socks are first and foremost about textile-engineered wear resistance, but in a cotton-based sock that is terry cushioned inside for comfort. Don't underestimate these humble terry loops either; the extra padding can be a real ankle, toe and foot-saver when you're on hard walks over rough terrain. Woven arch supports and reinforced toe seams help to keep both you and your socks going, mile on mile. Supplied in a twin pack, ladies Storm Bloc with BlueGuard Ankle High Hiking Socks come with a lifetime guarantee against holes.